305 mm/45 Mk105 х 2 pcs. 180 Degree Turn Time41.86 sec. Initial HE Shell Velocity831 m./s. Initial AP Shell Velocity831 m./s. 80 mm/40 3rd Year Type6 х 1 pcs. Ishizuchi — Japanese premium Tier IV battleship. One of the draft designs for a battlecruiser of the Imperial Japanese Navy that subsequently materialized as the Kongo class. The ship had a high speed and an impressive artillery. The arrangement of main turrets allowed her to fire a full broadside with all main battery guns. The known drawback of the ship's design was a very weak horizontal armor. Ishizuchi, while marketed as a Tier IV battleship, might properly be called a battlecruiser. She features quite good maneuverability and speed for a battleship, but her armor simply cannot take the punishment of her contemporaries like Kaiser or Wyoming. At first glance, she heavily resembles the Tier V Kongo, which is largely correct: Ishizuchi is essentially a Kongo prototype. She looks a lot like her Tier V cousin, but that's where the similarities end. Ishizuchi has a bearable rudder shift time of less than 13 seconds and a top speed bordering 28 knots, making her one of the faster battleships in the game. She also features five (5) twin-gun turrets containing decent 305mm guns. Unfortunately, she suffers from absolutely terrible anti-aircraft defenses and almost no armor, meaning she must be careful and look at the map often for torpedo bombers and enemy battleships. Her 305mm armor-piercing rounds will also give players some headaches. Don't expect them to reliably penetrate enemy battleships; hilariously, she is better off firing high explosive rounds at enemy battlewagons. With a 32% base fire chance out of her HE shells, she can reliably light enemy battleships on fire and keep them burning for extended periods of time. Thankfully, her AP rounds are perfectly serviceable against enemy cruisers, due to a low chance of overpenatrating the citadel. Great maneuverability for a battleship. Good health pool for her tier at nearly 50,000 hit points. Best-in-tier reload time of 25 seconds on her main battery. Excellent HE shell performance for her tier. Lots of secondary guns; destroyers trying to close with her will get a nasty surprise. Unusual for a battleship, her excellent HE performance and heavy secondary battery make her an effective destroyer hunter. 305mm guns deadly to cruisers. Paper-thin armor; most battleships and some cruisers can penetrate her main armor belt. 305mm AP shells are defective historically, and shatter on practically everything. High surface-detection of over 15 km. Easily citadeled between the #3 and #4 turrets due to a raised citadel. As a premium ship, Ishizuchi doesn't have any upgrades to research. The following information is provided for players who wish to create a permanent captain for the ship. Those players who are retraining captains or using the ship to gain extra experience for a captain should consult the page relevant to the ship to which the captain will be assigned. Be aware that Manual Fire Control for Secondary Armament does not provide the accuracy bonus it does to ships of tier 7 and up; it may be better to not have it. Ishizuchi has access to the Damage Control Party, and Repair Party consumables. Priority for use of premium consumables should be Damage Control Party, and Repair Party, in that order. As a premium ship, Ishizuchi comes included with Type 9 camouflage that lowers her detection radius, reduces the accuracy of incoming shells, and increases the amount of experience she earns. Ishizuchi is able to mount 8 flags simultaneously. Survivability flags are highly recommended in order to mitigate the damage she will receive in battle. Economy flags are somewhat recommended to boost the returns gained from a premium vessel, but could be used more effectively with higher-tier premium vessels. Flags that buff HE-fire chance are recommended in order to maximize on Ishizuchi's potent HE shells and fearsome fire-chance. Sierra Mike is favourably recommended in order to maximize on Ishizuchi's battlecruiser top speed. The Ishizuchi (石鎚, named after Mount Ishizuchi) is based off of Vickers Design 472 which is the originally accepted design for the Kongo-class of battlecruisers. After the rejection of B-39, B-40, and B-41 designs, Sir George Thurston redesigned the draft in 1911 in order to create Design 472 (known to the Japanese as B-46). This design was accepted and was laid down on January 11, 1911 in Barrow-in-Furness, Britain. The original design called for ten 305mm/45 guns mounted in five twin turrets, however, after being urged by Commander Kato Hirohasu and witnessing gun trials, the Japanese Navy made the decision on November 29, 1911 to alter the design to fit eight of the new 360mm/45 gun in four double turrets. These alterations were completed successfully and the ship was launched on May 18, 1912, and was christened Kongo. 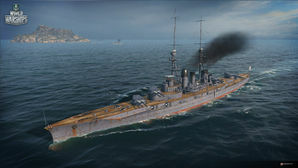 The name "Ishizuchi" was given to the design by Wargaming in accordance with the Imperial Japanese tradition to name battlecruisers after mountains. No ship in the Imperial Japanese Navy was ever named Ishizuchi. Vickers Design 472 cross section. This page was last modified on 29 June 2018, at 14:02. This page has been accessed 65,101 times.